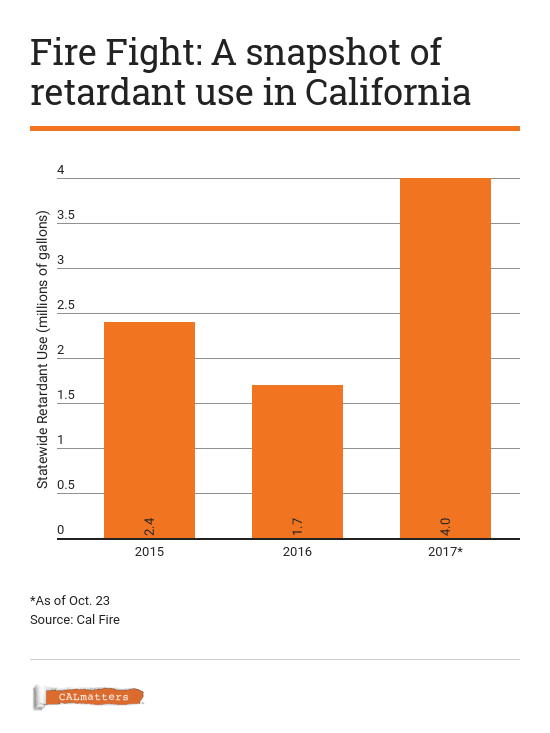 After Wildfires, What Happens to Crops Soaked in Fire Retardant? On one day during the recent fires, Oct. 12, crews loaded nearly 700 gallons of retardant a minute from dawn to dusk to help slow the fire, according to Cal Fire. By way of comparison: The state’s largest aviation facility, near Sacramento, pumped 1.7 million gallons of retardant into firefighting tankers in 2016. The base has already used more than 4 million gallons so far this year. 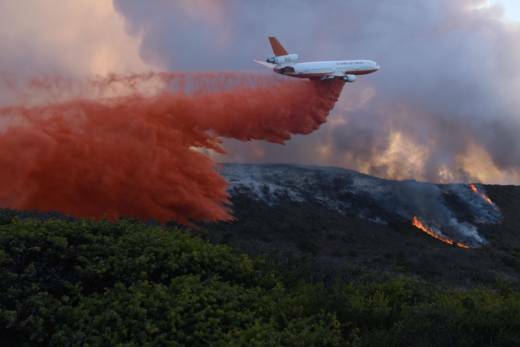 The retardant, called Phos-Chek, contains ammonium phosphate, a fertilizer. It also includes chemicals to regulate how the slurry drops, emulsifiers that render it gooey so it sticks to targets, and a coloring agent so air crews can track what they’ve dropped. For the most part, the ingredients are disclosed to Cal Fire by the Phos-Chekmanufacturer, ICL-Performance Products, LP. The chemicals are mixed with water and are generally harmless to humans and most animals, according to the company. But retardants are known to be toxic to fish, so state and national fire-fighting agencies prohibit drops within 300 feet of water sources. But as Western wildfires increasingly move out of forests and into developed areas, firefighters have less wiggle room to target their drops. “There is a precedent for concern about soil chemistry,” said Andy Stahl, executive director of Forest Service Employees for Environmental Ethics, a watchdog group made up of Forest Service employees and others. Improving soil productivity “would allow invasive plants that are better able to utilize these nutrients (to) crowd out natives.”How those interactions might play out in carefully curated vineyards is not known. Winemakers are famously fussy about soil: It’s what imparts the terroir that gives wines their unique characteristics. Some vintners choose not to use fertilizers of any kind. “A lot of time and effort is put into that soil,” said Andrew Walker, a geneticist at the University of California, Davis’ Department of Viticulture and Enology, which is devoted to all things wine-making. Fertilizers may be altogether undesirable, he said. Academics and researchers are beginning to study the issue—a good thing, Matousek said. “It’s something that’s going to come up more often.”The Napa County Agricultural Commissioner did not return phone calls for comment. The Wine Institute, an advocacy group for 1,000 wineries and business in California, declined to comment. A representative of a regional cannabis-growing association did not respond to a request for comment. “Individuals are advised against consuming fruits and vegetables from home gardens to which retardant may have been applied, or from areas in wildlands where residues are visible,” the agency said. “In addition to avoiding consuming food items with visible residues, the fertilizer component of the retardants may lead to temporary increases in the nitrate content of soils in areas of application.” Walker said plants take in chemicals in soils, but they also can absorb some chemicals to no ill effect.